Strong, long-lived tornadoes are possible today in the southeast as the first major severe weather outbreak of the season unfolds through the afternoon and evening hours. 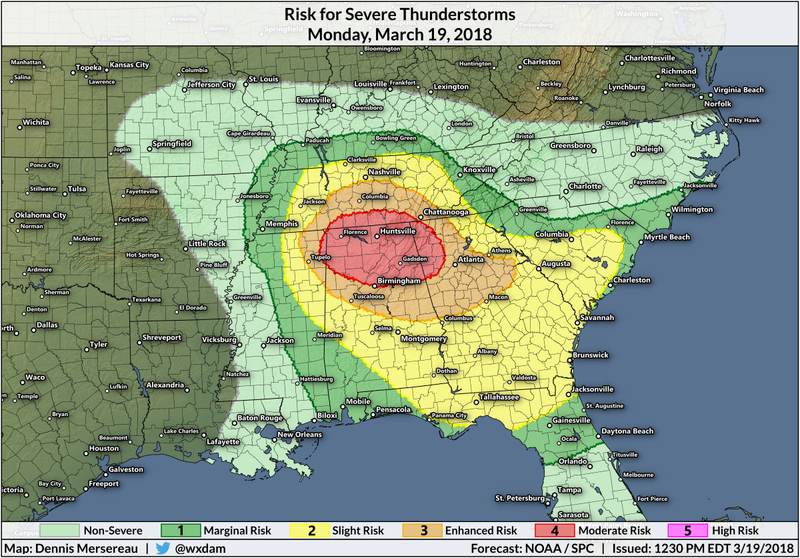 The Storm Prediction Center has issued a moderate risk for severe weather for parts of Alabama, Georgia, and Tennessee, which is a four out of five on the scale measuring the threat for severe weather. A combination of high instability and strong wind shear across the southeast today will bring the potential for all types of severe weather this afternoon and evening. The risk for significant tornadoes encompasses the enhanced risk and moderate risk areas. Some of the tornadoes in and around these shaded areas could be strong and long-lived. A threat for significant hail (larger than golf balls) exists across northern and central Alabama and parts of western Georgia and eastern Mississippi. This significant hail threat brushes the Atlanta metro area. All areas under a risk for severe weather today have the potential to see damaging winds; the winds in the strongest storms could exceed 70 MPH. The atmosphere appears primed for severe weather today. An upper-level trough and a low-pressure system crossing the Mississippi River into Tennessee will help fire off thunderstorms across the southeast starting in eastern Mississippi and western Alabama in the mid-afternoon hours. The storms will likely begin as discrete supercells, carrying the chance for all types of severe weather. The risk for significant tornadoes and the largest hail will be greatest in the supercells. 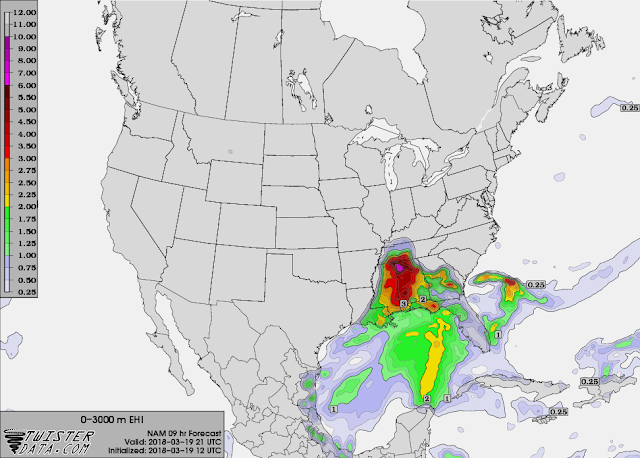 Today's severe weather threat is highlighted by the energy helicity index (EHI), shown at 4:00 PM CDT in the NAM model above. EHI is a standardized value that takes into account both instability and wind shear, two ingredients needed for a thunderstorm's updraft to begin rotating. Values greater than one or two indicate an environment potentially capable of supporting supercells that can produce strong tornadoes and significant hail. As we commonly see during a severe weather outbreak, the first round of storms in the middle and late afternoon hours will be discrete storms that could develop into supercells, which carry the threat for all forms of severe weather. Later this evening, it looks like the storms will merge into one or more squall lines, at which point the main threats transition over to damaging wind gusts and quick spin-up tornadoes. There's always a chance that thunderstorms and lingering rain from this morning could help cap the atmosphere and stifle significant thunderstorm development in some parts of the risk area. However, the experts at the Storm Prediction Center are confident enough in the threat for severe weather that they've issued a moderate risk, so take today seriously and prepare to act quickly if dangerous weather threatens your area. The threat for severe weather will travel farther east on Tuesday. Parts of Florida, Georgia, and South Carolina are under an enhanced risk for severe thunderstorms tomorrow, which is a three out of five on the scale measuring the threat for severe weather. We likely won't see a repeat of today, but any tornadoes, hail, or damaging winds, are dangerous if you're the one in the path of the storm. A tornado watch means conditions are favorable for the development of tornadoes over the next couple of hours. A tornado warning means that a tornado is imminent. A tornado warning is issued when weather radar detects strong rotation or a debris signature, or when a tornado or funnel cloud has been spotted. The safest place in a building during a tornado is the lowest level in an interior room as close to the center of the building as you can get. This is usually a closet or a bathroom. The idea is to put as many walls between you and the outside as possible. Interior bathrooms are ideal because the pipes in the walls can help stop some debris. If you are driving, do not stop under a bridge for protection from tornadoes or hail. Bridges offered no protection from tornadic winds or debris. If anything, a bridge is even more dangerous than being in the outdoors. Stopping under a bridge can also hinder traffic and threaten the lives of people stuck behind you in the ensuing traffic jam. If you're at home today, make sure you have sturdy shoes on in case you have to walk through debris. It's also a good idea to have helmets for everyone in your household in your safe place just in case you have to take shelter. The most serious tornado injuries are caused by blows to the head. It's not pretty to think about, but it's better to be safe than sorry. Make sure your cell phone is charged throughout the day just in case the power goes out. It's a good idea to have ready-to-eat food (like cereal or canned ravioli), bottled water, and batteries for real flashlights (your cell phone flashlight won't cut it) on hand. At best, a power outage is hugely inconvenient, especially if you haven't eaten dinner or your cell phone dies. Please consider subscribing to my writing on Patreon. Reader-funded journalism is more important than ever and your support helps fund engaging, hype-free weather coverage.